Here’s a hand typed partial link (your website does not allow me to include the entire link) with the w w w and the dot p d f at the end of the link missing so that I can post it. I also had to space the dots out to get it accepted on this website. This is a long term study done by the FAA and DOT of thermoplastic applications at Newark Airport. On page 28, under conclusion, it states that the thermoplastic that was applied with adhesive had the longest lasting result on Portland Cement. How much would it cost to place colorized asphalt in the bike lane area? 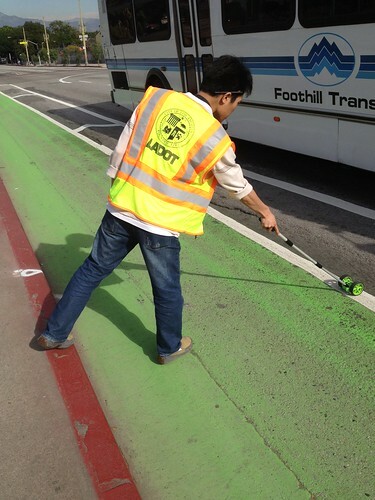 LADOT bikeways may want to look into having street services dye the asphalt green for bike lanes on future street resurfacings. This would lower the costs of installation and maintenance considerably. Metro requires a wider right side lane to keep the buses away from parked car doors and to prevent hitting a bicyclists head. Why doesn’t LADOT make a proposal to Metro for taking some of that space away by putting in a buffer area between the bike lane and the bus lane much like the Spring St. bike lane. This will create some traffic calming by narrowing the travel lane and increasing the comfort level of bicyclists as the motorized traffic will be further away. It will also create a space between the buses and the bikes so that the risk of a bus mirror hitting the cyclists would be very low. Increasing the comfort of cycling will also tend to attract cyclists off of the sidewalk and that will in turn increase the comfort level of the pedestrians. Allowing some of the traffic lane space to be used as a buffer will also make it easier to put in a bike lane on many streets and in many instances this could accomodate a bike lane installation without taking out a travel lane. Behr concrete stain takes 72 hours to dry enough for automotive tires to travel on. Recoat after 2-4 hours if necessary for a uniform stain. It also may become slippery when wet. 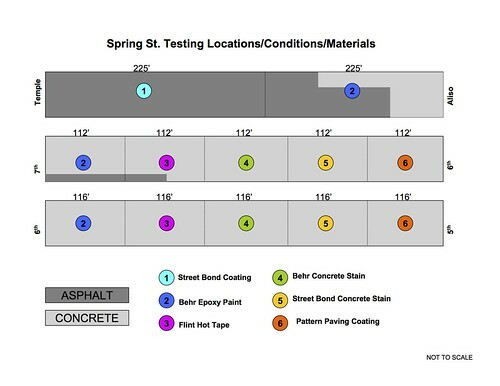 Street Bond concrete stain I could not find on the manufacturers website. It must be a new product. Also, looking through the agendas for City Council Transportation Committee meetings since January of 2008 I found 36 requests for speed increases in the San Fernando Valley and only 2 elsewhere. So, if the intent for putting in bike lanes in the San Fernando Valley is to get people to ride on them, then LADOT should also try to slow the overall speed of motorized traffic to make it comfortable enough for humans to ride a bicycle in the bike lane. A way to do this is Psychological traffic calming. Narrowing the drivers sense of the width of the road by putting a buffer and greening the bike lane. Also, by narrowing the right lane by putting in a buffer should enable LADOT to convince Metro to accept a less wide right lane as I mentioned in a previous post. 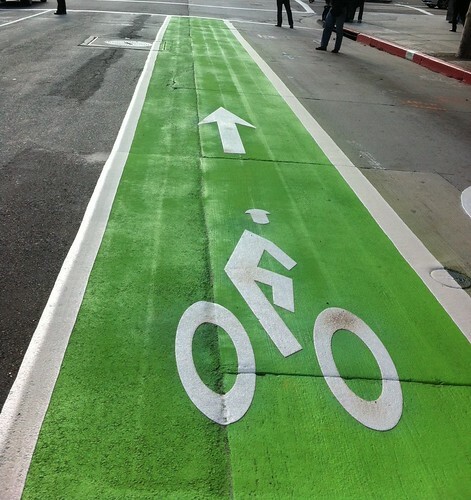 If LADOT could get street services to incorporate a green dye for bike lanes when streets are resurfaced, then that would provide lower overall installation and maintenance costs. If street services does not have the equipment to do a dyed asphalt bike lane when resurfacing, then please mention to them that the Netherlands uses a separate paver for the bike lanes and it could be worthwhile for them to look into obtaining this equipment. Calming the streets would also lower the citizen demands for the Police Department to spend time trying to keep the overall speeds from becoming excessive. Traffic calming would also lower the expense of having to replace the speed limit signs. The injury to pedestrians and cyclists from motorized vehicle collisons would be lessened if the overall traffic speed was reduced. Or, LA street services could buy a machine to do put in dyed asphalt for a bike lane and then rent it out to other cities within the county. Certainly, Santa Monica and Long Beach would likely show some interest in utilizing equipment that can do this. Applying a coating to the street is likely to have a life span of 5 years or less, compared to ten years or more with dyeing. Is it true that this road planning assumed some streetcars that currently don’t have access to the roads even if rubber tired entirel yprivate? In that the space, some of it, recovered, was not initially intendedto be exclusivel yfor just cdars and ‘buses’? I also think this is a poor labratory, and the poorest choicesfrom prior testin g should not be imposed buteachtimethevery best that canbetrieid should be installed. Eachtiemi yougob ack it’s an opportunity to have it paintedover. I also find it so odd that street parking remains with the loss of anintgerior lane insteade of it. Street parking serves so few- i realise deliveries etc. will be hard if yo ucan’t park on thecurb, but special vehicles that are ver ynarrow or able to climbup and park othe curb long enougbhtodrop offgoods make sense, andthereis analley for someoftghebuildingsaswellthatthe trash gtets pickedupfromandgood couldbedroppedoffvia? Slippery when wet issues deserve debate. I oppose enabling such hazardoous high pressure narrow tired bikes when theyare no longerneededa s wide lowe presure or notslippable tires canbe augmented with clean powertrains that use the road more efficeintly as well but hav e an open mind and used to mock mountain style bikes as deterring use. Thecity bike,the green lane vehicle, has great acceleration notn just roughroad dependent upon brakes. I especially object to hogging users, slow etc. arguing incompatiblilty with electric etc.bikes. Isupporrt a wider agerange then only hujman powered rules impose, b ut the greeen lane can’t support elderly too slow to handle decentspeeds sole users of vehicles onit if it’ too handle enogh capacity to really get people to maybeygive upthe entiore roadto there use asthey should. You are to lead, not follow, youare our expertsw, it’s not present user so fbikes advocating, it’s you who must at least speak the truth i fnot make kidonly, flat frequently, tranistional, equipement, welcomeas wwell. The implimentation should liv e up toit’s promises. with say antilcok equiped bikes are encouraged. the horizontal wipouts are not an issue the the straighttraffic. a curb entry inthge middle fohte b lock sounds greatforthat infact. yes antilock brakes beign requird on 700’s makes great sense for city use. people would leanrto brfeak sooner. and not get run over for lsoing traction w hichis inevitrable onthse bikes whose low rollingresistance encouragesspeedsthey cant’s safely stop in evenif brake equiped. especially duringtheportino ofhte path that sudeen brakingishteproblem for! Is the cost currently so high that led’s embedded would be cheaper? If so shame on you!